A prominent Republican Congressman, Rep. Darrell Issa, R-California, said Friday that a special prosecutor should be appointed to investigate the alleged Russian hacking of the U.S. elections and also whether any of President Donald Trump's campaign associates had contacts with Russian officials. Speaking Friday night on "Real Time with Bill Maher" show, Issa said that an investigation should also be carried out by the Senate and House intelligence committees because Jeff Sessions might be biased on certain levels and that would not lead to a proper probe. "You're right that you cannot have somebody, a friend of mine, Jeff Sessions who was on the campaign and who is an appointee. 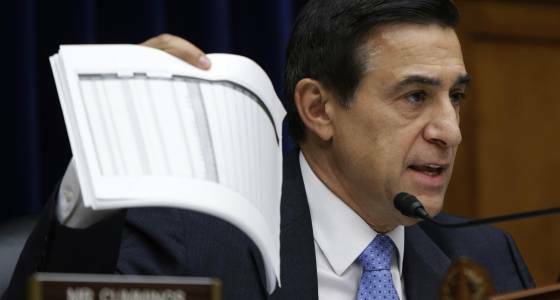 You're going to need to use the special prosecutor's statute and office," Issa said. The following day, Issa, the congressman from San Diego County, told the Mercury News that Russia was "an evil, smaller empire" and that it should always be kept under check. He added that the Republicans must portray their leadership over Russia by thoroughly investigating matters that have come up in connection with the alleged hacking into the U.S. presidential elections. "For credibility, we have to hold this president to the level of transparency that the last president made every effort to thwart,” Issa said. “We have to make sure that this is a transparent administration." Issa, who was the former chairman of the House Oversight Committee, told NBC News that Russian President Vladimir Putin "murders his enemies." Issa said that a special prosecutor is not only necessary because of the dangers posed by the Russian president, but it also might reveal that Trump's associates had no such faults that have been alleged toward them, according to CNN. "We're going to have to do it," he told Maher. "There may or may not be fault, but the American people ... are beginning to understand that Putin murders his enemies." "We're going to ask the Intelligence Committees of the House and Senate to investigate within the special areas that they oversee," Issa added.